We are an independent Christian school with a distinctly Catholic ethos, seeking to provide meaningful education in the African context by facilitating a holistic yet spiritual thrust in teaching and learning towards achieving a disciplined and nurturing environment for young ladies, notwithstanding the prevailing challenges of contemporary society. As adherents to the preservation of life we promote Christian values in order to develop a balanced work ethic while encouraging independent, innovative and critical thinking inn learners. In providing a safe and nurturing learning environment for holistic education, we support the appointment of staff who embrace the professional standards of commitment and accountability not only to sustain lifelong learning, but to achieve optimal stability and self-reliance. The Holy Cross Congregation is a religious congregation under the Catholic Church. It was founded in Switzerland in 1849 with its founding mission being the provision of education wherever this need exists. This meant providing education for poor young girls at a time when there was no state provision for education. The Holy Cross Congregation works in countries across the world in South America, Europe and the United Kingdom, Asia and Africa. The Sisters arrived in South Africa as a missionary order in 1883. Their first school was established in Umtata, providing education for the disadvantaged. Their work extended further into the local community with them not only founding schools all over South Africa, but also establishing and building orphanages, hospitals and homes for the elderly where the need for these facilities existed. Many of the Sisters are also nurses and social workers who are closely involved in working in and with communities. 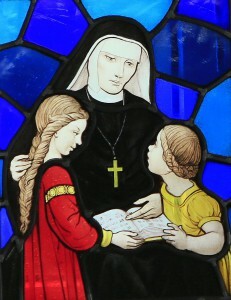 The Sisters opened different schools in Cape Town as well as an orphanage and Teacher Training College (St. Augustine’s). Many of these are now classified as state schools on church property. The Teacher Training College had to close in 1974 due to the enforcement of the Group Areas Act and its orphanage moved into the Cape Flats. In 1910 the Sisters decided to open a school in Maitland, starting their work in old farm buildings and developing the property over the years. The school offered boarding facilities and both primary and high school education up to 1974 when a new primary school was built in a nearby suburb. Thereafter the Maitland premises continued to function only as a high school for girls. The school has, during its years in Maitland, faced many battles to survive. During the apartheid era, government funding was withdrawn from independent/private schools and to ensure the school’s survival, the school was financed by the Sisters. Holy Cross High School was one of the first “open” schools in Cape Town, not only as regards its learners, but also as regards its staff. It was forced to close its boarding facilities in the 1980’s due to the decreasing numbers of Sisters. These rooms have subsequently been converted into classrooms as the school’s numbers increased. In 2009 the last Holy Cross Sister as principal of the school passed away and for the first time in its history, a lay principal was appointed. In 2010 the school celebrated its centenary year. Current and Future developments: The school is committed to education that is based on Gospel values, the upliftment of communities, particularly women, upholding justice and the dignity of the person. It has also accepted the challenge of providing education for refugees and immigrants from other African countries. He entered the Capuchin Franciscan Order, 22 October 1825, was ordained priest in 1830, and appointed novice master, and lecturer on philosophy and theology. 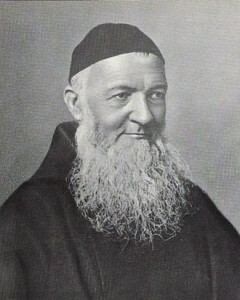 In 1838 he became guardian at Baden; in 1845 superior and parish priest at Chur; in 1857 definitor, and in 1860 vicar-general of the Diocese of Chur. After the Sonderbund war, the Radical party opposed Catholic interests. In consequence of his defence of the Church, Father Theodosius fled to Alsace in 1841. In August of the same year he returned. He founded the Institute of the Franciscan Sisters of the Holy Cross. In the Capuchin church at Altorf on 16 October 1844, the first three sisters received the habit of the Third Order of St. Francis. Their constitutions enjoin upon them to make themselves all to all in order to win souls to Christ and to do nothing which might repel any from their mode of life. From this foundation grew the congregation of teaching sisters, with their mother-house at Menzingen. Later on Father Theodosius founded the congregation of Sisters of Mercy at Ingenbohl. Both were actively engaged in educational works; the Sisters of Mercy set up, besides, homes for the poor and sick, and undertook private nursing. In the meantime Father Theodosius was himself busy as a schoolmaster. He superintended the people’s schools (Volksschulen), which are attended by others besides the poor. He promoted continuation schools and was in favour of technical instruction for apprentices and workmen. He founded anew the suppressed Jesuit College, Maria-Hilf zu Schwyz. To stir up anew Catholic life he engaged in popular missions and retreats for priests. The institution of the annual conference of the Swiss bishops was largely due to his efforts. 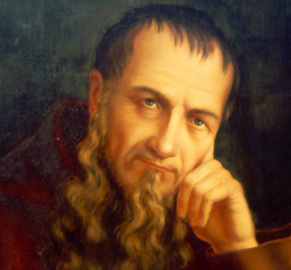 To bring Swiss Catholics together to strengthen Catholic feeling, and to organize social works, he founded the Pius Society. “Formerly monasteries were turned into factories, now factories must become monasteries, and the profits must be shared with the workers”. Factories were established to carry out this idea, but they failed, owing to a lack of business capacity in the founders. At Ingenbohl Father Theodosius founded a printing and book-binding establishment and a society for the distribution of books. Heimgartner’s cause for sainthood commenced in 1952 under Pope Pius XII after being titled as a Servant of God. Pope John Paul II confirmed she had lived a life of heroic virtue and named her as Venerable on 26 March 1994. Maria Anna Heimgartner was born on 26 November 1822 in Switzerland as the fourth of six children of Heimrich Josef Heimgartner (1788–1836) and Anna Maria Trüb. Her father died in 1836 when she was fourteen and this forced her to assume greater home duties. Her maternal uncle – Karl – served as a church pastor. Her initial education spanned from 1829 until 1837 in Fislisbach and then served as a nurse for children in Baden from 1838 until 1840. In 1840 – on the advice of her priest and confessor Theodosius Florentini – she received training as a teacher from Capuchin nuns. She studied from 1841 until 1844 with the Ursulines in the German city of Freiburg in the Breisgau region. She entered the novitiate of the Sisters of Divine Providence in 1843. 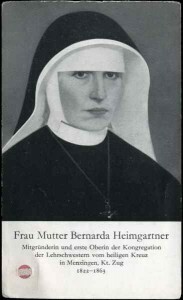 Heimgartner made her religious profession on 16 October 1844 in Altdorf in the name of “Bernarda” while relocating on 17 October 1844 to Menzingen. Heimgartner and Florentini – with three others – established their congregation in October 1844 but conflicts with Florentini from 1854 to 1856 saw the separation of the two orders he co-founded: one in Ingenbohl and then her own. Her time as the head of the order witnessed the establishment of a total of 59 homes and schools. Heimgartner would often mention that “our fountain of life is Divine Providence“. In 1859 she was diagnosed with pulomary tuberculosis. She relinquished her post as Mother Superior on 21 September 1863 to Sister Salesia Strickler. Heimgartner died due tuberculosis on 13 December 1863. Her order was later aggregated to that of the Third Order of Saint Francis. As of 2005 there was 2132 religious in 244 houses while there were 138 German religious in 2013. To which my heart is grown. are those which do us bind. Into life’s toil I’m thrown.